Yesterday the FT ran the following photo, shot by AP photographer Riccardo de Luca, above-the-fold in its Europe edition. The unspoken message is clear: you’re old, and it’s time to leave. 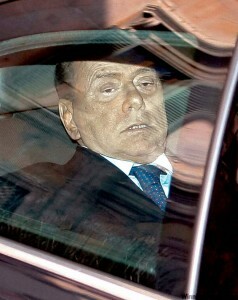 Even in a recent broadcast, Berlusconi seems old and tired — his hair obviously dyed, the wrinkles showing. My personal distaste for him notwithstanding, I was surprised to see chinks in the Cav’s armor. He maintains an almost fanatical control of his image in press — which is not hard when one owns or controls most of it — but some quick searches turned up some amusing old photos. Most are not worth commenting on, unless you’re really curious about how he looked with a full head of hair, except one. Italy in the 1970s was an incredibly dangerous place where kidnappings — especially of wealthy industrialists and their families — by the Mafia were common. This photo is a fascinating scorchio — a snapshot — into the mind of the man who would be king, and who knew as much, three decades ago. The pistol on the desk is surely no accident, especially if, as the Daily Mail reports, he spent two hours on the photoshoot. It’s intriguing to wonder what it means, especially given the claim that he packed heat in event of a Mafia kidnapping. The gun is there, but it is on the table. It is not pointed at anyone, and it is not on his person — a tacit signal in a carefully-coded language that Berlusconi is a man with whom the syndicates could truck with, rather just extract a one-time payment from by dint of force. 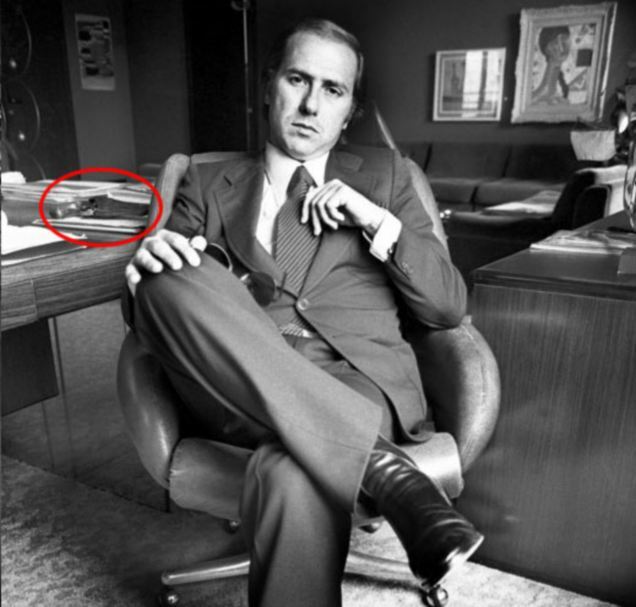 Pure speculation — but what is certain is that the year after this photo was taken Berlusconi would found Fininvest and join Propaganda 2. Over the next five years, he would earn 113 billion lire, €58.4 million in today’s currency, in transactions obscured by “endless financial Chinese boxes…entirely unfathomable to outsiders” and “bizarre businesses…set up under prestanomi (nicknamed accounts with dummy holders),” in the words of Tobias Jones. Around the same time, he hired Vittorio Manago from Sicily to work as a groundsman at Arcore, who died a decade ago in prison doing time for a double murder and drug trafficking. Suspicion, as the saying goes, is the antechamber of truth. This entry was posted in electoral crisis, il cav, italy, the italian right, the right in europe and tagged berlusconi, fininvest, gun, italy 1970s, kidnapping, mafia, P2, tobias jones, vittorio manago. Bookmark the permalink.